The editor of the Daily Star endured a bruising encounter at the Leveson inquiry today, facing sustained questioning over her newspaper's coverage of Muslims. Counsel Robert Jay repeatedly showed Dawn Neesom front pages of her newspaper and asked if she considered them "ethical". "A journalist might feel the headlines we've been looking at stray way over the line of what's ethical," he said. 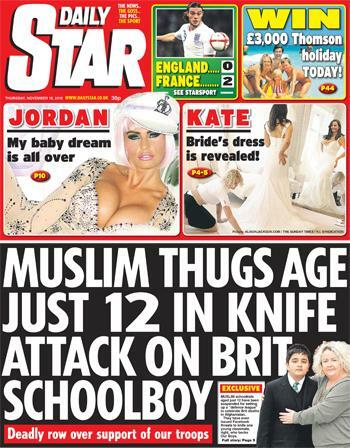 Mr Jay showed one front page featuring the headline: "Muslim thugs aged just 12 in knife attack on Brit school boy." He branded the language "tendentious", pointing out that the victim was described as "British", but the perpetrators, who were also British, were described as "Muslim". He also pointed out that the 'attack' actually referred to a comment on Facebook. "It's not good," Ms Neesom admitted. She promised to pursue the issue "back in the office". Asked repeatedly to demonstrate examples of positive coverage of Muslims, Ms Neesom could provide only one example – a story about a Muslim man who lost his son during the August riots and called on the community not to take revenge. Ms Neesom promised to provide the inquiry with other examples of positive coverage. "We'll see what you provide," Mr Jay replied. Ms Neesom insisted that as an employee of a Jewish-owned company she had never allowed positive coverage of the far-right English Defence League (EDL), despite media experts raising serious questions about the tone and prominence of its coverage of the group. Asked about any arrangements for journalists to whistle-blow on issues they had with the working culture at the newspaper, Mr Jay suggested her answer was "another example of rather thin and non-existent systems". Online, former Daily Star journalists ridiculed their old boss as she gave testimony. "It's funny how much Dawn 'isn't aware of' seeing as she stands at the subs [subeditor's] desk verbally writing the P1 [page one] headline on a daily basis," one said. Another wrote: "Someone buy Jay a pint. I've waited to watch Neesom skewered like this for a long, long time."